Integrators who manufacture assembly automation and OEM’s who need equipment to manufacture assemblies are faced with a very large challenge of how to get the parts into the assembly machines for the assembly process, minimize workcell requirements, and keep costs down. Whether there is a need to increase productivity, reduce costs or add product variants, flexible part feeding systems are well suited to improve applications that have complex parts and sustain frequent part changes. Applications include small parts assembly (mechanical and electrical), material handling, and packaging. Feeding parts into an assembly process is traditionally done using a variety of methods. Some parts are presented scattered in multiple orientations in boxes or in bins, and can be heavy or awkward to lift, position, and orientate into a workcell. In other processes, parts are fed using feeders such as vibratory bowl feeders, gravity fed part tubes, as stacked or fixtured material, by being manually loaded onto kitted pallets, and by using dedicated tooling. These methods can cause high costs, large floor space requirements, be unflexible, and difficult to maintain. It can also be a challenge to ensure parts enter the assembly process undamaged, in the correct orientation, and in the most cost effective manner. The detailed and cumbersome processes used in these traditional methods can cause extensive waste and prove inefficient over time. In many traditional part feeding processes, manual operations are required when feeding parts from one point to another. Many times these parts are difficult to move by hand because of their size or shape. They can cause significant downtime due to varying factors such as complex workcells, mistakes, or injuries. Lower yields can occur due to human error in cases where the wrong parts are placed into a station, which can lead to damaged tooling. The more parts are handled and fixtured, the more chance there is to damage the part before the assembly process. The labor to install, integrate and maintain dedicated tooling can also be expensive. Space is also limited in an assembly workcell, and consolidating the number of assembly steps performed without altering workcell footprint can be cost effective. For traditional part feeding processing, adding multiple operations to one workcell can lead to costly tooling, and a complex and congested assembly workspace. This can result in longer downtime and difficult repairs if there are any issues. Quality suffers when it isn’t easy to refine a process or adjust parameters that cannot be discretely controlled. Flexible Part Feeding solves these process issues effectively and efficiently. What is Flexible Part Feeding? A flexible parts feeder can be a system used to feed (or load) parts into a manufacturing process. The best kind of intelligent flexible feeder system includes a feeder, a vision system to locate the part for the next process, and a robot. This type of system can overcome the high cost of traditional parts feeding by loading a wide variety of parts in varying sizes, shapes and orientations, and singulate them onto a conveyor for example. The advantages of a flexible parts feeder is that you can present many different parts into an assembly process through the same part feeding mechanism and let the vision system determine what parts to pick and how to pick them. Can be automatic feeders such as bulk, vibration, brush, carpet, bowl, or step feeders. Allow for multiple part shapes to be fed. Eliminate jamming due to fixturing and tooling designed to crowd the part. Support efficient singulation where parts that are not singulated sufficiently can be recirculated. 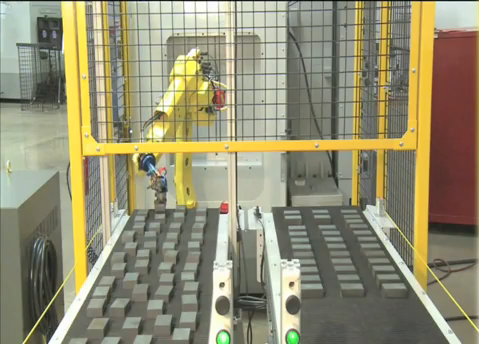 FANUC Robotics uses iRVision® for part location. iRVision® is Integrated Robot Vision which is the integration of a camera interface built into the robot controller. 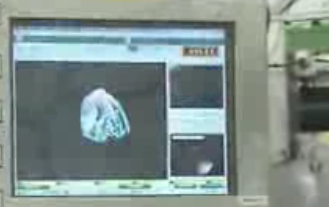 One or more cameras can be attached to the robot, or they can be in a remote location. In traditional processes, if you want the robot to manipulate every workpiece in the same way, you need to place every workpiece at exactly the same position. iRVision® is a visual sensor system designed to eliminate such restrictions. iRVision® measures the position of each workpiece by using cameras, and it adjusts the robot motion so that the robot can manipulate the workpiece in the same way as programmed even if the position of the workpiece is different from the workpiece position set when the robot program was taught. All of the application-specific tools developed to simplify the use of the camera as a guidance, identification, or inspection tool are integrated with the robot. Can handle multiple parts at one time. Makes part changeovers a breeze. Can identify parts in multiple orientations. Can identify parts in 2D or 3D. Can error proof the parts as they enter assembly, as well as the assembly itself. Reduces or eliminates fixturing costs. 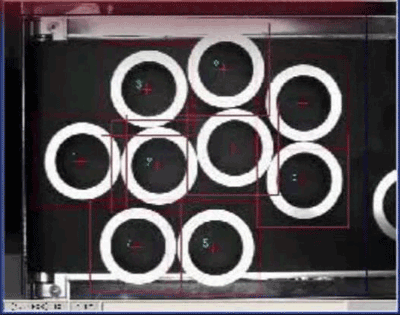 iRVision® is also capable of tracking and identifying parts as they are moving down a conveyed line. This is extremely useful in a Flexible Part Feeding operation. Flex Part Feeding is not possible without an adaptive picking process that can locate parts as they are being presented to the assembly process. You also need an efficient method to change the pick location if necessary. 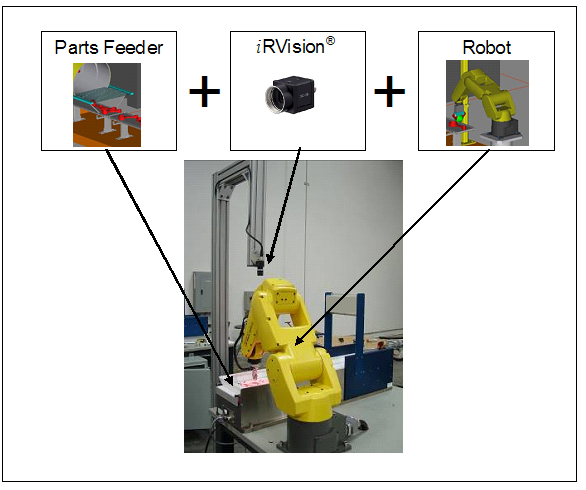 Vision Guidance with a camera is the primary tool used to locate and adapt pick position for FANUC robots based on randomly located parts feeding into an assembly process. Without a tool like iRVision®, flex-feeding is essentially impossible. The primary criteria for a camera based flex feeding solution to work is to have the ability to take a group of parts and singulate them so that the camera or vision system can identify each part individually, locate the part, and than send a location to a robot so the robot can pick them individually off a conveyer, table, or from a bin (structured or mixed). Robots are critical to an efficient and effective part feeding process as well because now that the parts can be presented easily in many different positions and orientations, you need the flexibility of a robot system to be able to pick the parts. The robot advances parts picked in correct orientation through to assembly. By having multiple parts be presented to a process through the same part feeding mechanism, you can save on expensive floor space. You can also save on a vastly reduced need for fixed, dedicated tooling, and your assembly area is less cluttered enabling you to maintain the process easily and add additional processes to the same workcell if necessary. 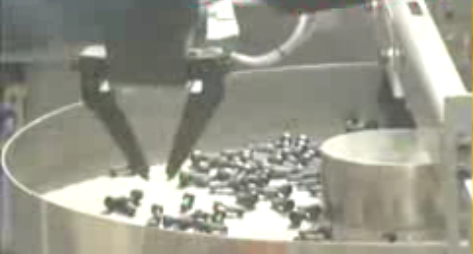 An M-10iA robot can be used to load randomly placed parts into a machine tool. Parts are later removed after they are machined and placed on an outbound conveyor in preparation for assembly. In another application, an LR Mate 200iC robot equipped with iRVision® is used to find randomly placed cylindrical parts to be placed into a machine tool. The parts are then machined precisely as they are prepared for assembly. 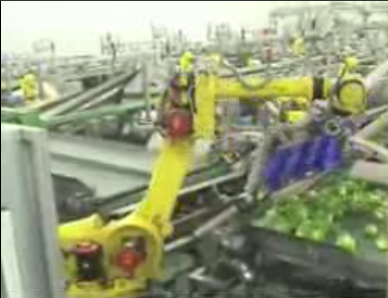 Robots are an effective tool in the food processing and packaging industry. Some FANUC Robots are specifically designed to meet the stringent requirements in the food industry as they have enclosed rust-free construction that can withstand sanitizers used to prevent food contamination. 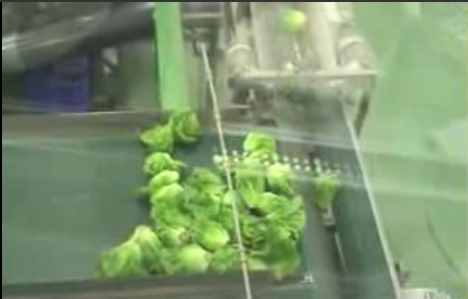 In one application example, lettuce heads are first dropped randomly on a conveyor. After the lettuce heads are singulated, a vision system measures the shape and form of the lettuce and determines where to cut the root. 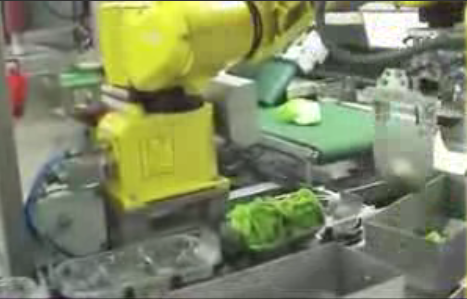 The FANUC LR Mate 200iB robot helps to perform a second check on the lettuce head to determine its size. If it passes the final test, the lettuce head is then placed successfully into plastic trays. The FANUC LR Mate 200iC robot and M-16iB robots can be used in intricate motor assembly operations. iRVision® is used to locate the reducer shaft and allow for pinion assembly. The M-16iB uses iRVision® to locate screws randomly placed in a parts feeder for assembly. Upon completion of assembly, the robot places the finished part onto a rack and locates parts to assemble another motor. Wire forms can tangle easily when they fall into a box. 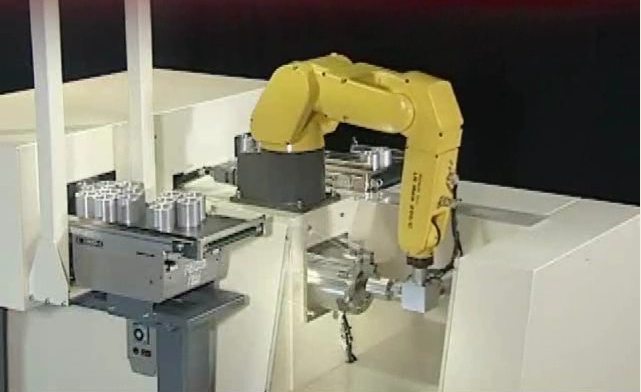 A FANUC M-10iA robot with iRVision® can be used to pick up wire forms that have been fed onto a conveyor using a step feeder, and stack them neatly before placing them into a box. 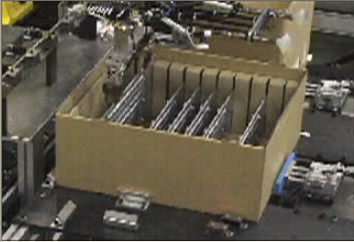 iRVision® is used to find the part on the conveyor so that the robot can pick it up. 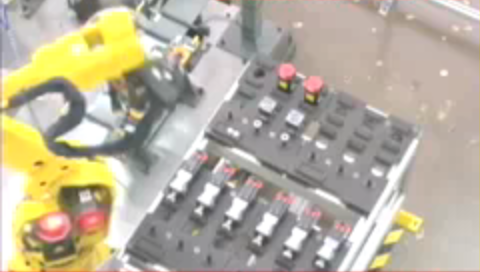 To eliminate the wire tangling, the robot sorts the parts before stacking them in the box. Robots using iRVision® can assemble consumer electronic parts such as circuit boards. Parts can be placed randomly on the conveyor, in any orientation, and the robot, using iRVision®, can find them for placement later into an assembly process. 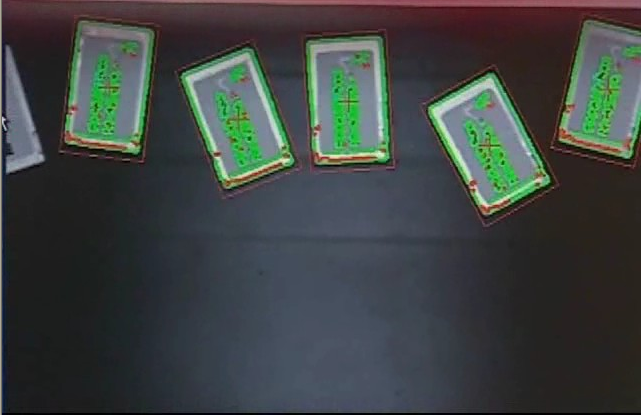 Vision can be used to find highly sensitive circuit board parts of varying sizes stacked in boxes and then use a robot to place the parts into an assembly. Multiple robots can be used to streamline the process and improve the speed at which parts are fed. Two LR Mate 200iC robots equipped with 2D Vision and a rotary flexible parts feeder can be used to assemble ink pens as shown below. iRVision® is used to pick multiple parts of the pen from the flexible parts feeder so that the robot can assemble the pieces. The LR Mate 200iC can adapt quickly to small lot sizes, new styles, or other modifications providing an affordable and flexible solution for small part production. A FANUC M-1iA high speed parallel link robot and an LR Mate 200iC robot can be used to assemble and disassemble solar panels. 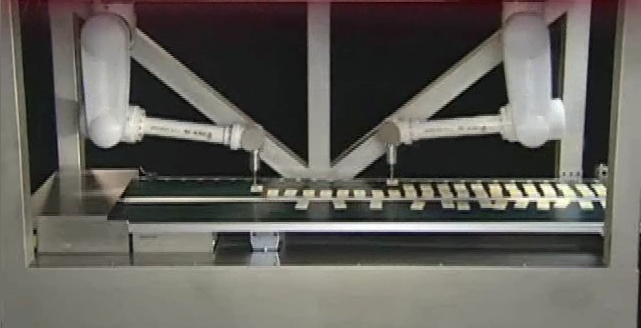 The M-1iA robot, equipped with iRVision® Visual Tracking, can pick randomly located solar cells and form an array of solar cells on an outbound conveyor. An LR Mate 200iC robot is used to locate the array using iRVision® and transfer it to the top of the solar panel for assembly. 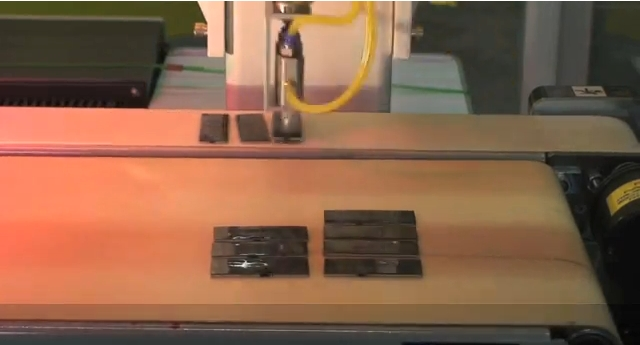 The robot then picks a glass panel from a magazine and places it on top of the solar cell. All of this is done without the use of expensive fixturing in a precise environment so the solar panels are not damaged.